"Do You Dare?" 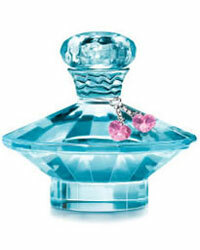 Curious Perfume by Britney Spears launched in 2004 by Elizabeth Arden. "An exhilarating white floral wrapped in the sensuality of vanilla-infused musk." Available in 1oz, 1.7oz, 3.3oz Eau de Parfum Spray, 6.8oz Shower Gel, 6.8oz Body Polish, 6.8oz Body Souffle, 0.7oz Body Shimmer, 0.5oz Perfume Stick, 0.16oz Perfume Rollerball and Lip Gloss Duo. An exhilarating white floral wrapped in the sensuality of vanilla-infused musk. Irresistibly fragrance blooms of Louisiana magnolia touched with a flirtatious hint of golden Anjou pear and dewy lotus flower tempt the senses. The anticipation builds with a fresh bouquet of natural flowers. Early morning tuberose is accented with sun-kissed petals of star jasmine. Energetic pink cyclamen brings an unexpected twist to a rich floral heart. As the excitement of the dare unravels, vanilla-infused musk reveals itself, speading an addictive aura through the fragrance. This unforgettably sensual musk impression is enveloped in rich creamy sandalwood and radiant blonde woods. The sparkling facets of the azure blue glass incite curiosity. The heart-shaped charms inspire luck in love. An azure blus atomizer lends a timeless, feminine touch (on the 3.3 fl. oz. size). A creamy body souffle that leaves the skin sleek and deliciously scented. Use this flirty puff to apply pink Body Shimmer where you want to get noticed. A delicate cleansing gel that invigorates and refreshes the body. Have it both ways. Fragrance for your sensual side. Lip gloss for your flirtatious side. Just grab and go! Show some skin! Massage this scented body polish all over then rinse to reveal silky-smooth skin. This solid perfume stick glides on to leave a fragrant shimmer on the skin. "Do you dare?" An alluring fragrance from Britney Spears! Comes in a sparkling blue glass bottle to pique your curiosity. Magnolia, pear, lotus flower, glowers, morning tuberose, jasmine mixed with cyclamen, vanilla, musk and sandalwood. "Do you dare" to try the original Britney Spears Curious perfume? Notes: Exhilarating white floral accented with Louisiana Magnolia and wrapped in vanilla-infused musk.